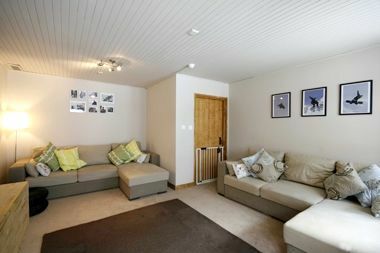 Chalet Morzine is a fantastic find for style-savvy skiers considering hitting the slopes with a little one in tow. The chalet underwent a complete renovation for 2015 so guests can expect a more beautiful surrounding than ever for their holiday. Mountain Mavericks' owner's Olly and Emma have two little ones themselves; Luc (6) and Lola (3) and are also expecting twins who will arrive in time for Winter 2014/15. 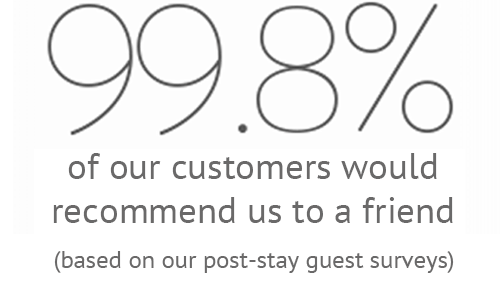 As a result, BFB guests can be confident that the management are exceptionally well-versed in the needs of young families and very happy to offer advice and arrange services from nappy packs and nannies, to lift passes and ski boots! Chalet Morzine offers dedicated family-friendly ski weeks on selected dates during the season (2015 dates:Jan 4th and March 1st ). On these dates families can relax in the knowledge that their fellow guests will not be child-free grown-ups who may be less than enthusiastic about sharing the chalet with mini guests, but will be like-minded parents with their own little ones. 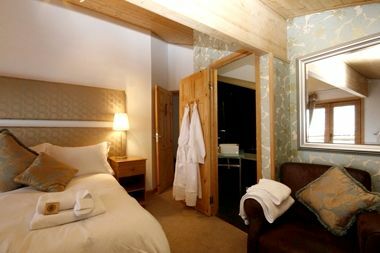 Prices for w/c January 4 & March 1st and 15th 2015 are by the room based on 2 adults + 1 child (0-12) occupancy and include: cooked breakfasts, afternoon teas, 4-course dinners with wine, use of the hot tub, sauna, chauffeur service to and from slopes/resort centre until 1.30am. Plus, during family-friendly weeks, 5-days childcare, cot/toddler bed, highchair, toys, pushchair, baby hamper (nappies, toiletries etc.). Return transfers from Geneva are extra and charged from €65pp including age appropriate child seats. The chalet itself is scenically set in the largely unspoilt and charming Valley de la Manche, 3km from the centre of Morzine. It is far enough from the bustle of town to ensure relaxation, yet ideally located for access to the Nyon ski lift and no more than a few minutes’ drive from either the Avoriaz or Pleney/Les Gets areas. Emma and Olly operate a very handy minibus service to take guests around the local area. Included in the price is chauffeured transfers to and from the slopes and to and from Morzine centre, for nightlife, until 1.30am daily. Morzine town is stunning when dressed for winter, with a feel of eternal Christmas; it retains its sense of community. Still resembling the original village with wooden facades, carved balconies and slate roofs. Although Skiing and Snowboarding are the most common reasons for visiting in winter they are far from the only activities available, as parapenting, snow-mobiling, ice-skating or dog sledding are some of many activities available without missing any of your skiing day. However most people come here for the skiing and it is no surprise why. Morzine's Pleney Telecabine accesses the plateau and is the best place for early days and those in lessons, by offering the best range of blues and greens and being accessible on foot. The other side of town is 'Super Morzine' which links directly to Avoriaz, which is also accessible via the Telepherique de Prodain. 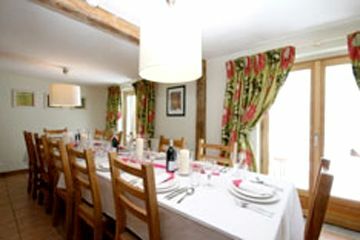 All are a short hop from the chalet and also easily linked via the free bus service. For those that are after a challenge in their skiing there are many hidden off-piste gems, including the trees of Lindaret or Combette, the infamous Swiss Wall, Chamossiere and the Col du Fornet, running down the head of the Valley de la Manche, almost to the door of Chalet Morzine. Avoriaz was the first resort in Europe to build a snowboard park and has maintained a reputation for being at the forefront of catering for the freestyle generation ever since. These days there are 3 parks in Avoriaz alone, with also a rail run through the trees of Lindaret and for 2008 a Burton sponsored Stash run, another first for Europe. There are also parks in Crozet, Chatel and Mont Cherie, altogether catering for complete first timers to the world’s best, as well as everyone in between. The scope of variety and choice means you can ski a different area each day of the week and almost need not to follow the same piste twice. If you fancy getting away from the crowds and enjoying some of the most beautiful areas, there are numerous ski de fond (cross country) tracks as well. 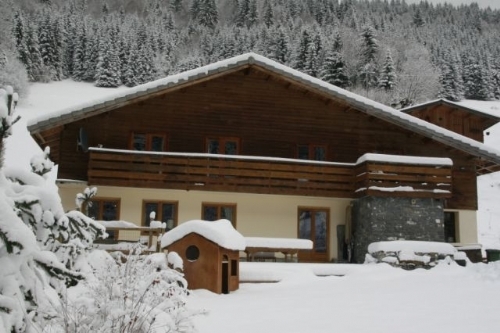 Nearest Medical Services: The centre of Morzine is 5 minutes drive away in which there are several doctors. Childcare is not included in the price outside of specific 'baby weeks' but is easily arranged. Hello and welcome to our little section! It's a great opportunity to introduce ourselves and for you to get to know us. Myself and my 'now' husband Olly came to Morzine out of sheer desperation to escape London, start our own business and try for a family. We succeeded in all 3! Winter 2011 is our 4 th winter here and our son Luc will be 3 years old! My how time flies! We now have 3 catered chalets in and around Morzine, a laundry company and a locations & production company all based from our little office, Olly built! Me - Emma, runs the office taking bookings and organising every part of your holiday from meeting you at the airport to making sure that you have enough nappies for the week. Oh, I forgot, I also run the laundry business - washing and ironing over 60 beds per week (I like to forget about that!). Olly, loves showing you the mountain and giving you the best days skiing you can remember - he is also the man about town, transferring you to and from the airport and makes sure that your holiday is running perfectly. During the summer months we both run the chalet - Olly dons the chef's whites and creates a feast on the BBQ and I fluff the cushions and serve the wine! Morzine offers a special something for everyone of every age all year round. Winter is our main attraction due to the lovely white stuff that falls, covering the 650KM of pistes that surrounds Morzine and the Portes du Soleil, making it the largest linked ski area in the world. There are slopes for every age and every ability and plenty of gorgeous Alpine 'vin chaud' stops along the way. The summer is a fast growing holiday destination, offering numerous activities for the children and adults alike - a fabulous climate and a relaxing atmosphere. 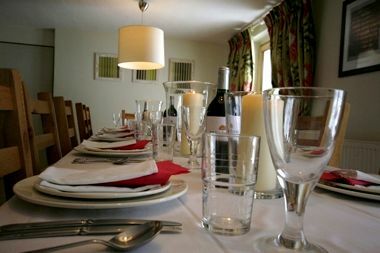 We love the chance to show the mountains to all whilst looking after you in our lovely chalet. We have spent the past 4 years - doing this and that and adding this and that to really give a welcoming and friendly atmosphere while providing luxurious comfort. It's such a pleasure to meet new clients and wave you off at the end of a week as new found friends. Children love; I think most of all the Playroom! The mountains of toys - all boxed for certain ages, the beautiful plush fitted carpet (which is far nicer than bare wooden floors in most chalets!) and the library of DVD's (sorry!) Coming in a very close 2nd is the large garden, where in the winter huge snowmen can be found and in the summer the sand pit and little mini chalet with many outdoor games whiles away the hours! Kids love the interaction with the chalet staff, in particular the chef who gets them involved in making their own pizzas and makes cooking (and the eating part) fun! Apart from bringing their favourite 'Mr Bunny Rabbit', we have everything they could need at the chalet from sledges to bumbo's and Peppa Pig DVD's to Thomas the Tank Engine story books. For the Mum's and Dad's it's also nice to know that we have (and is included in the cost) easily adjustable Tripp Trapp high chairs to Bumbo's and Baby Bijorns to all the branded nappies you need for the week. Thus making packing and the all important baggage allowance - tres easy!! excellent facilities, location and hosts. Will be back.